Director – Fritz Lang, Screenplay – Fritz Lang & Heinz Oskar Wuttig, Story – Jan Fethge, Producer – Artur Brauner, Photography (b&w) – Karl Löb, Music – Gerhard Becker, Production Design – Erich Kettelhut & Johannes Ott. Production Company – CCC Film Produktion G.M.B.H. Police inspector Kras receives a phone call from the psychic Peter Cornelius who predicts the murder of journalist Peter Barter at the traffic lights moments before it happens. In investigating the murder, Kras discovers there have been an alarming number of suspicious deaths of high-profile people where the common factor is that all have stayed at the Luxor Hotel. Kras finds links to the late criminal mastermind Dr Mabuse and comes to believe that Mabuse is still alive. Meanwhile, Henry B. Travers, a wealthy American nuclear power plant magnate, signs in at the Luxor to do business. He discovers Marion Menil about to jump from the ledge of the adjoining room and persuades her to come down. As Travers tends Marion, the two begin a romance. Meanwhile, Inspector Kras sets a series of traps to see which of the people at the Luxor is Dr Mabuse. Fritz Lang was one of the great directors of the silent era and one of the key figures in early German cinema. Lang first appeared at Ufa where he made amazing efforts such as Siegfried (1924), Metropolis (1927), Spies (1928), Woman in the Moon (1929) and, into the silent era, M (1931). These are astounding cinematic works that are the height of the German Expressionist movement and have left ripples that are still with us today. Lang made numerous works that fall within the fantastic genre (see below for a full list). He fled Germany in the 1930s with the rise of the Nazis and then began a career in Hollywood making a series of psycho-thrillers and film noirs. One of Fritz Lang’s most celebrated works was Dr Mabuse, The Gambler (1922), an extravagant crime drama in two-parts that starred Rudolf Klein-Rogge as the titular criminal mastermind controlling others with the power of his will and manipulating the fates of people and entire countries for pleasure. It was a huge hit. Lang made a sequel in the sound era with The Testament of Dr Mabuse (1933) but this would be the last film he would make in Germany for two-and-a-half decades as it was seen as having seditious elements by Nazi Propaganda Minister Josef Goebbels and Lang subsequently fled to take refuge in France and then the US. From his time in the US onwards, Lang abandoned the extravagant genre material with which he had made his name and turned to making a series of studio crime films and film noir thrillers – the only one of these that approached genre territory was the psycho-thriller Secret Beyond the Door (1948). In the late 1950s at the age of 70, Lang made a return to Germany (which was now two entirely different countries, West Germany and East Germany) and directed the last three films of his career with the two-part adventure film The Tiger of Eschnapur (1959) and The Indian Tomb (1959), as well as The 1000 Eyes of Dr. Mabuse here. For English-language release, The Tiger of Eschnapur and The Indian Tomb were recut as a single film Journey to the Lost City (1960), which was released after 1000 Eyes, leaving some debate about which you can consider to be Lang’s last film. Lang was starting to lose his eyesight at this point – he would not make another film and died in 1976. These last three German films are Fritz Lang in essence returning to his roots – the exotic adventure films he specialised in in the 1920s and most obviously the Dr Mabuse films here. Lang creates a fabulously cinematic opening for the film – Police Inspector Kras (Gert Frobe) receives a phone call from the psychic Peter Cornelius warning him of a murder about to happen, just as a car pulls up at the lights and a bespectacled assassin (Euro horror regular Howard Vernon) fits a machine pistol together and shoots the journalist in the car alongside him, Lang then pulling back to an overhead shot as all the other vehicles drive off when the lights change but the dead man’s car remains there. This sets The 1000 Eyes of Dr. Mabuse off to a great start. Gert Frobe, the German actor who gained international fame not long after as the title villain in the James Bond film Goldfinger (1964) and subsequently appeared in Chitty Chitty Bang Bang (1968), makes for a perfect replacement for Otto Wernicke as the burly but sharp-witted detective. 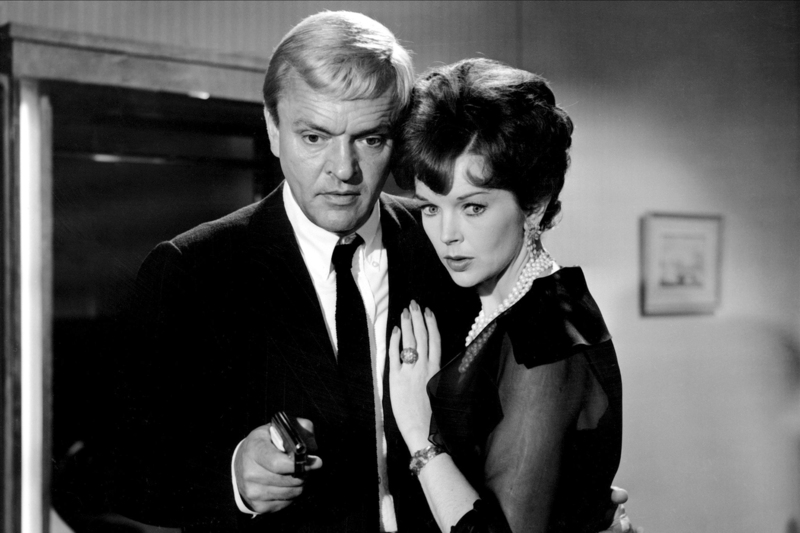 The film is peopled by all manner of intriguingly shaded supporting characters/suspects – the suicidal Dawn Addams; her club-footed, cruelly controlling husband; the jolly and rotund insurance salesman who also happens to wear a shoulder holster. Particularly fascinating is the eerily prescient character of Peter Cornelius – like when he takes off his dark glasses during a reading and reveals white eyes lit up in the dark, or the scene where Gert Frobe gathers all the suspects at Cornelius’s house and Cornelius conducts a seance and predicts an assassination attempt seconds before a bullet hits the chair where he was just sitting. On the other hand, The 1000 Eyes of Dr. Mabuse lacks the visual flair of Fritz Lang’s other works of the silent era, which were conceived as visually stupendous architectural fantasies. Contrast, for instance, the rather ordinary hotel rooms where much of this film takes place with the amazing quasi-Expressionist hotels and gambling halls that the first Dr Mabuse took place amidst. 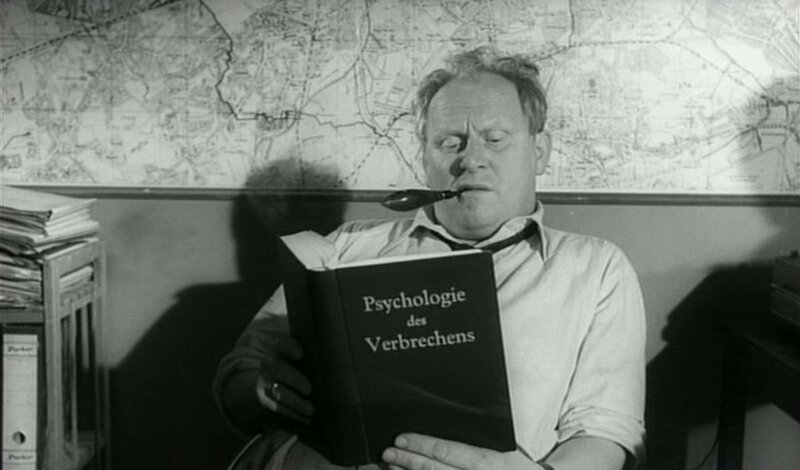 Certainly, it is a Dr Mabuse film that has readily adapted to the modern era – rather than sitting atop the decadence of Berlin between the wars, this is West Berlin of the tense and suspicious Cold War era, where on the other side of the divided city the Stasi were monitoring the entire populace. (The Berlin Wall would be constructed the year following this). It results in an, at times, creepily paranoid work set amid closed circuit tv monitoring, hidden passageways and one-way mirrors to look into adjoining rooms (and certainly makes the film, in its tackling of the surveillance society, well before its time). And with the suggestion that the hotel that Mabuse has turned to his arcane purposes was originally constructed by the Nazis, you can see it is Berlin over which the country’s recent past still casts a giant shadow. It is also far more of a mundane Dr Mabuse film – Lang, for instance, has eliminated Mabuse’s ability to control minds and everything takes place as a commonplace crime drama. Certainly, the resolution of the film is the disappointingly dull stuff of shootouts and a boiler-plated on car chase sequence. [PLOT SPOILERS] Even the initially strikingly fantastic character of the psychic is revealed to be a scam being run by Mabuse. This is part of the problem with the script’s vagueness – we are never exactly sure why Mabuse is eavesdropping on people in the hotel, faking predictions as a psychic, not to mention supposedly being responsible for the suspicious deaths, which are never dwelt upon beyond first mention. There is also the revelation that he has set up suicidal Dawn Addams in order to lure Peter van Eyck into a trap but it is never clear why van Eyck is crucial to Mabuse’s plans. 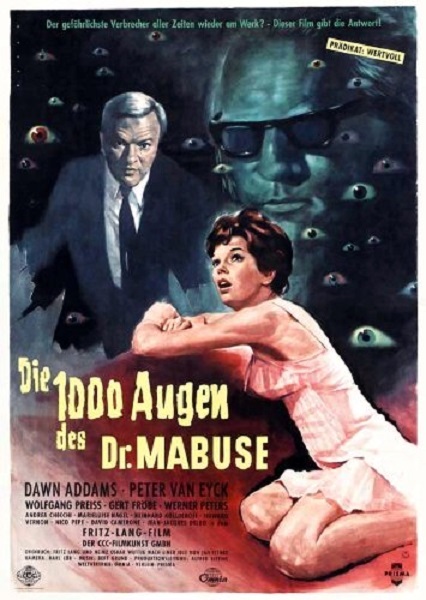 The 1000 Eyes of Dr. Mabuse was a success and spawned a series of new Dr Mabuse films made in West Germany during the 1960s, all under other directors. These were:- The Return of Dr Mabuse/The FBI Versus Dr Mabuse (1961), The Testament of Dr Mabuse (1962), The Invisible Dr Mabuse/The Invisible Horror (1962), Dr Mabuse vs Scotland Yard (1964) and The Death Ray of Dr Mabuse/The Secret of Dr Mabuse (1964). All but the last featured Wolfgang Preiss playing Dr Mabuse. Gert Frobe returned as a different police inspector in Return and Testament, while Peter van Eyck turns up playing different characters in Scotland Yard and Death Ray. There have been sporadic other Dr Mabuse films – a modernised version from Claude Chabrol with Dr M/Club Extinction (1990) and the American independent film Doctor Mabuse (2013).